It was a night to remember. 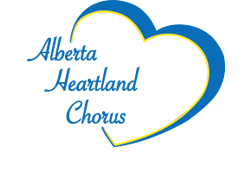 Alberta Heartland Chorus, along with their guests "The Heebee-Jeebees" and "The Command Sisters", filled the theater with thier own special brand of music. The audience ranged from small children to seniors, and they all found something to relate to. The quartets: Chance!, Double Take, Leading Note and Leap of Faith, added another level to the entertainment. The chorus travelled around the world in song and story, from Canada to Europe and Africa, and then back to North America and Christmas in Banff. The beautiful backdrops brought each location to life. Music ranged from Canadian folk songs, to Country and Western, and Chrismas carols. Outside, there was a blizzard blowing, but inside, the connection between the audience and performers kept everybody warm and comfortable.